Below is a selection of projects with testimonials from those involved. Did the finished workshop meet your expectation and outcomes? Definitely! We were delighted with the finished product and have received many positive comments from staff, pupils and parents on the quality of the outcome. What do you feel you have gained from this workshop? 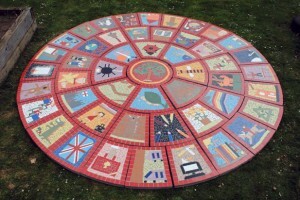 We gained a great deal in terms of working collaboratively on the design and execution of the mosaic, enabling all children to take part and have ownership. 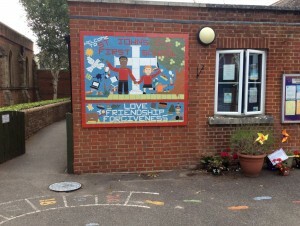 You have for the second time provided the school with a unique mosaic that has pride of place on the wall that parents face as they bring their children in to school every morning. Did the finished workshop meet your expectation and outcomes? Far exceeded my hopes, the work is fantastic and the whole school is delighted. What do you feel you have gained from this workshop? Some beautiful art work of which the children can be proud of consolidation of a school idea/ a new type of art of which staff and pupils are now aware. It was a pleasure to have David in the school, all the children and staff felt welcome in the project, even those who were not directly taking part. Did the finished workshop meet your expectation and outcomes? Exceeded both. What do you feel you have gained from this workshop? Stunning features for the school, enjoyment and pride not just for pupils but staff and parents united as a school in this lasting achievement. We all had a fantastic time thanks for your hard work and commitment and going above and beyond. Did the finished workshop meet your expectation and outcomes? Absolutely. We are delighted with the end result. What do you feel you have gained from this workshop? 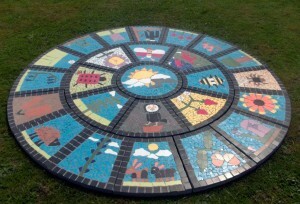 All the children and staff participated in the creation of the mosaic. 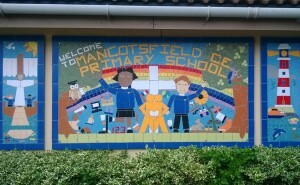 It was a shared experience and the final mosaic looks wonderful. Pupils and staff are already pointing out the bits they did. David was very professional in his approach. He was well organised and led us through the whole experience really well. He definitely focused on ensuring the ideas for the design came from the pupils and consulted carefully with them. Did the finished workshop meet your expectation and outcomes? Excellent. 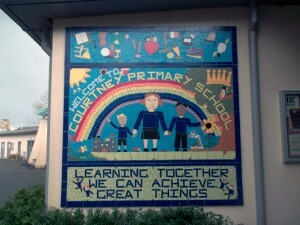 The childrens input and ownership of the project has enabled them to feel very proud of their mosaic. It is exceptionally well designed and made, delivering a high quality finished piece. What do you feel you have gained from this workshop? 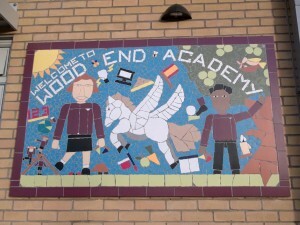 A visual image, for all members of the community to see our school. A wonderful experience David, you were very accommodating of all the end of year school activities and quietly got on with the work. Thank you for making it happen so smoothly but with every child (and adult) feeling part of the journey. Did the finished workshop meet your expectation and outcomes? Yes it is wonderful. I’ve got so many compliments & positive feedback. What do you feel you have gained from this workshop? Ideas of how to apply mosaic work into normal lessons. I’ve seriously enjoyed the experience of working with you and the children. I surely won’t forget this and will recommend to my teacher friends. Did the finished workshop meet your expectation and outcomes? The final mosaic exceeded my expectations, all the staff were very impressed and have already asked if we could have David come back to do some more. What do you feel you have gained from this workshop? 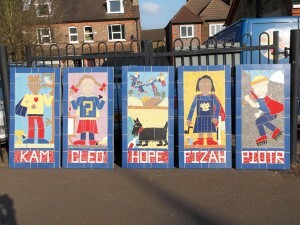 The children gained a real sense of achievement, especially those whose designs were picked. To see a project all come together and look impressive was fantastic and the children were all very impressed. I hope that they realise that through hard work and time you can achieve greatness. I loved the laid back approach that David took arranging the design and it made the project very easy to organise. 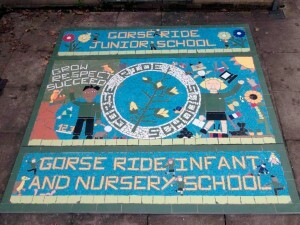 The children who took part came away feeling very pleased with the work they had done and I think that when the mosaic is out they will feel very proud. Did the finished workshop meet your expectation and outcomes? Exceeded expectations thank you. What do you feel you have gained from this workshop? Team building amongst parent helpers. Sense of pride and satisfaction for those who contributed. David is extremely personable and easy person to work with. He gave lots of constructive ideas as to how school stakeholders could become involved in the project.